This is a spacious 3 bedroom house with 2 bathrooms and a large family room. 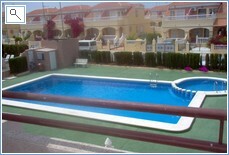 There is air conditioning throughout and a balcony with sunbeds for private sun bathing. The house is also right next to the swimming pool. There is a built in BBQ in the side garden and plenty of room for two tables for Al Fresco dining. 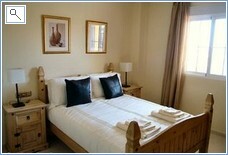 There are also bicycles for guests use The area is renowned for its many beautiful beaches and wonderful golf courses. The house is just 5 minutes walk from a vibrant strip of Bars and restaurants and only 10 minute walk from the nearest beach and marina. 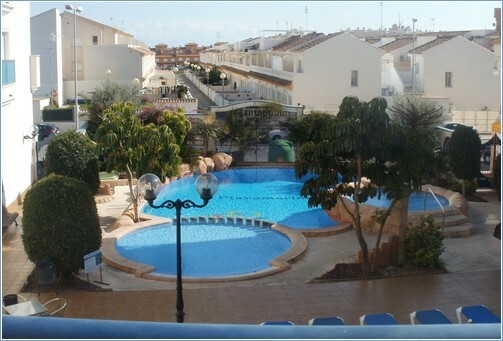 There is a super communal pool just two minutes walk away, with the "Blue Flag" beach at La Zenia just 5 minutes away, the water park at Torrevieja 10 minutes drive and a hop skip and a jump to a large supermarket. Bars and restaurants and entertainment just minutes away. For the golfer we offer an ideal base for four superb courses at Villamartin, Las Ramblas, La Marquesa and Campoamor. Drive for just 20 minutes and you can be playing at La Manga with the opportunity to visit the many bars and restaurants on offer. Markets are lively and frequent during the season. Beaches are numerous and all within a 5/15 minute drive along this sunshine haven. For those looking for a more cultural avenue, the historic cities of Elche (with its palm tree lined streets) and Murcia with its numerous historical buildings and attractions are only minutes away. For those who prefer the countryside there are numerous walks and the pink flamingoes are a must see! Playamarina 2 is uniquely placed at the middle of the Cabo Roig Strip which has many bars and restaurants only 2 minutes downstairs. A supermarket is 5 minutes walk away .The perfect location for a holiday if you do not want to hire a car as everything you need is within walking distance, 2 beaches 10 minutes away. 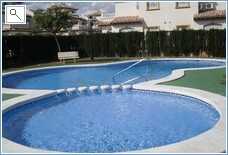 The apartment has a pool, children's pool and a jacuzzi and a pool bar for residents only. A 24 hour reception area and very friendly staff. 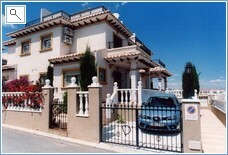 Major Golf courses Las Ramblas and Viillamartin within 15 minutes drive. The new shopping centre La Zenia boulevard is only 10 minutes by car or you can walk which would take about 25 minutes. 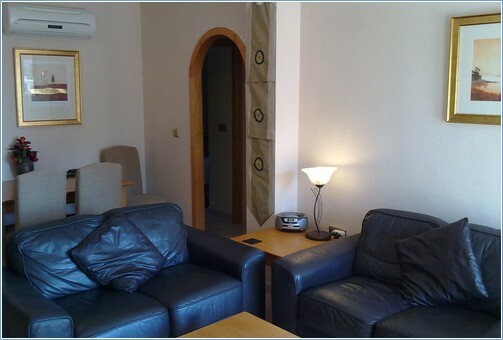 A beautiful second floor two bedroom apartment which consists of one double room, one twin bedded room, kitchen, bathroom, dining room and lounge. 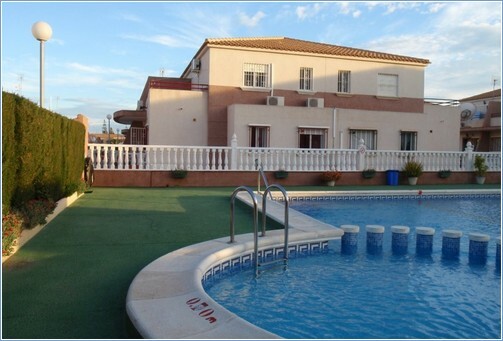 It is located at Campoamor and is superbly equipped to an extremely high standard with everything you need for a very enjoyable holiday. There is a very pleasant balcony off the lounge with lovely views of the area and the sea. 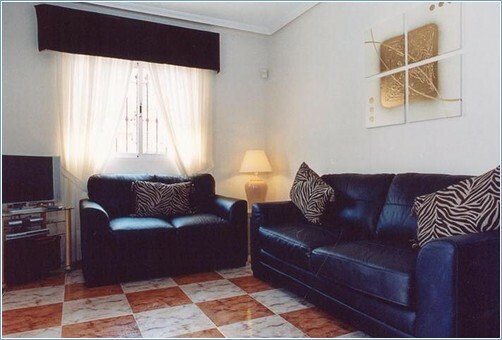 The property also benefits from satellite TV with English channels, air conditioning and is also only 25 metres from the communal pool. 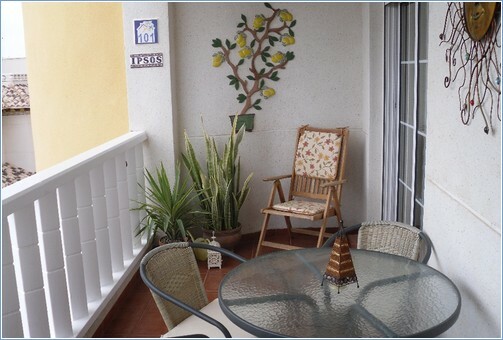 The apartment is equipped with parasols, chairs, loungers, picnic box etc. all available for your use. 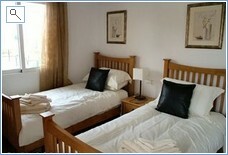 Ideal for Couples, families or golfing holidays. Fully Equipped for families (travelcot, highchair, bottle steriliser etc). 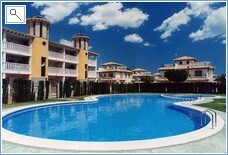 communal pool onsite and walking distance to beach. 3 championship golf courses within 10 minutes drive. Walking distance to many bars and restaraunts.